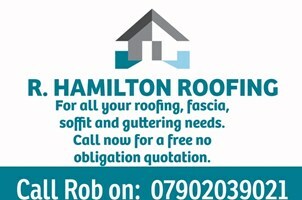 R Hamilton roofing - Roofer based in Southsea, Hampshire. Hi there my names Rob. I am a self employed roofer from Portsmouth and have been roofing for over 20 years now. I am new to this site but don’t let that put you off as I have a lot of experience in my line of work and Customer satisfaction is a must. I will reply to you within the hour and come and carry out a free no obligation quotation. I can then assess what works need doing and take photos to show customer and talk through the options available to carry the the works whatever they may be. Before and after photos will be taken on every job and all new works come with a minimum 10year guarantee I carry out all forms of roofing work from tiled to slate roof renewal or repairs,flat roof systems such as torch on mineral felt or grp (fibreglass) roofing systems,Leadwork,cement works,dry ridge and verge systems,fascia soffits and guttering, velux window installation or renor other similar brands and hardiplank external cladding or other similar products. All works are guaranteed and I am fully insured for 1million pounds. Portsmouth, Southampton, Fareham, Gosport, Chichester, Petersfield, Midhurst and other surrounding areas.